Hereditary hemorrhagic telangiectasia (HHT) is a vascular disorder characterized by epistaxis, arteriovenous malformations, and telangiectases. The majority of the patients have a mutation in the coding region of the activin A receptor type II-like 1 (ACVRL1) or Endoglin (ENG) gene. However, in approximately 15% of cases, sequencing analysis and deletion/duplication testing fail to identify mutations in the coding regions of these genes. Knowing its vital role in transcription and translation control, we were prompted to investigate the 5'untranslated region (UTR) of ENG. We sequenced the 5'UTR of ENG for 154 HHT patients without mutations in ENG or ACVRL1 coding regions. We found a mutation (c.-127C > T), which is predicted to affect translation initiation and alter the reading frame of endoglin. This mutation was found in a family with linkage to the ENG, as well as in three other patients, one of which had an affected sibling with the same mutation. In vitro expression studies showed that a construct with the c.-127C > T mutation alters the translation and decreases the level of the endoglin protein. In addition, a c.-9G > A mutation was found in three patients, one of whom was homozygous for this mutation. Expression studies showed decreased protein levels suggesting that the c.-9G > A is a hypomorphic mutation. Our results emphasize the need for the inclusion of the 5'UTR region of ENG in clinical testing for HHT. Hereditary hemorrhagic telangiectasia (HHT) is an autosomal dominant vascular dysplasia characterized by epistaxis, telangiectasesand arteriovenous malformations (AVMs). AVMs that occur in the lungs, brain, or gastrointestinal tract can cause life-threatening complications secondary to either hemorrhage or the shunting of blood through abnormal blood vessels [1–5]. HHT is diagnosed on clinical grounds when an individual has three or more of the following diagnostic criteria: spontaneous- recurrent epistaxis, mucocutaneous telangiectases (especially on tongue, lips, oral mucosa, fingers, and nose), internal AVMs (pulmonary, cerebral, hepatic, gastrointestinal, spinal), and a first degree relative with HHT. The diagnosis is considered possible or suspected when two criteria are present and unlikely when there are fewer than two . HHT is a clinically heterogeneous disorder, with symptoms often differing among family members, making the disorder difficult to diagnose [7, 8]. HHT is a genetically heterogeneous disorder for which mutations in more than three genes cause disease. The majority of the clinically diagnosed HHT patients have a mutation in the coding regions of the Endoglin (ENG) gene or activin A receptor type II-like 1 (ACVRL1) gene [9–15], leading to HHT1 or HHT2, respectively. Mutations in SMAD4 have been detected in approximately 2% of patients with HHT and cause HHT and juvenile polyposis (JP/HHT) syndrome . At least two additional genes, at 5q31.3-32 (HHT3)  and 7p14 (HHT4) , have been suggested by linkage studies. Currently, molecular diagnosis of HHT involves sequencing of ACVRL1 and ENG coding regions, large deletion/duplication analysis, and if no mutation is identified, analysis of SMAD4. Approximately 15% of HHT cases have no mutations found in coding regions of these three genes [19, 20]. But linkage studies in some of these families still implicate the ENG locus (PBT unpublished data). This is possible if mutations are in the noncoding regions such as introns or regulatory parts of the ENG gene. In particular, mutations in the 5'UTR may explain the pathogenesis of the disorder in some cases, since most of the transcription and/or translation protein complexes bind and regulate expression from the 5'UTR of the gene [21, 22] Based on this information, combined with supportive linkage data to the ENG, we decided to investigate the role of the 5'UTR region of ENG. We sequenced this region in 154 unrelated HHT patients who do not carry a disease causing mutation in the coding region of the ACVRL1 and ENG genes by sequencing and deletion/duplication analyses. Our study group consists of 154 unrelated HHT cases. Cases included were those with two or more HHT clinical diagnostic criteria reported by their physician and negative mutation results. Information regarding HHT symptoms and manifestations was obtained from a disorder specific history form completed by ordering physicians and/or by assessment at the HHT Center at the University of Utah. Cases selected were negative for mutations by sequencing of the coding region and intron/exon boundaries, and also deletion/duplication analysis of the ACVRL1 and ENG genes. This study was approved by the Institutional Review Board of the University of Utah. The control group consisted of 134 healthy individuals. Based on the mutation results from the study group in Utah, a later collaboration was established with the Spanish HHT Genetics group to include one additional family with the c.-127C > T mutation. Although this family is not part of 154 patients' cohort, it has been included to provide additional clinical correlation for this mutation. Genomic DNA was extracted via automated Magna Pure (Roche Diagnostics, Indianapolis, IN) from whole blood. Primers were designed to amplify the entire 5'UTR region of ENG, BigDye sequencing chemistry was used to sequence the PCR products in both directions using the ABI 3730xl DNA analyzer (Applied Biosystems, Foster City, CA). The sequences were analyzed by the Mutation Surveyor program (Softgenetics, State College, PA). The variants detected were compared to the NCBI dbSNP databases to determine if the nucleotide change found in our study had previously been reported in healthy individuals. 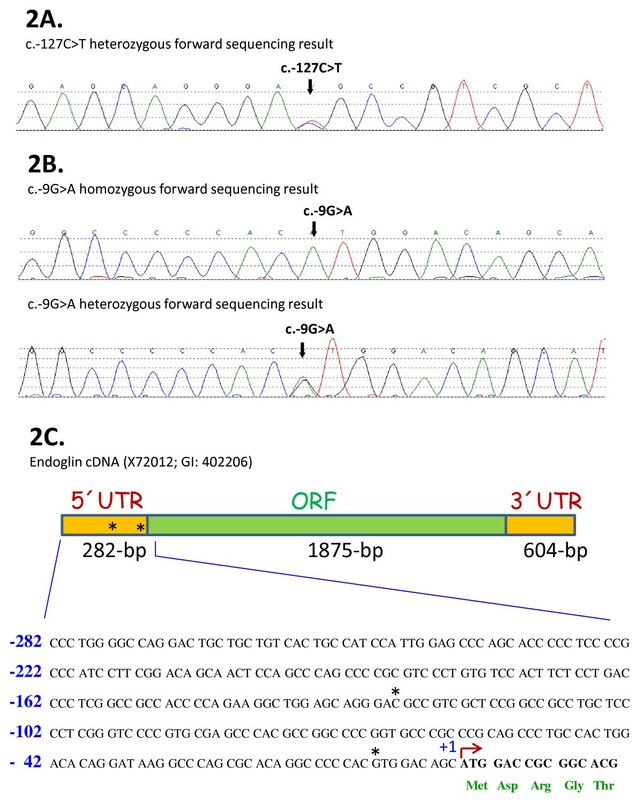 The 3-kb fragment of human endoglin cDNA cloned in pUC13 was previously described . This plasmid was used as a template to generate the single endoglin mutants c.-9G > A and c.-127C > T. The mutant c.-9G > A was amplified using the following primers: 5'- AGGCCCCCACATGGACAGCAT -3'(Forward) and 5'-ATGCTGTCCATGTGGGGGCCT -3' (Reverse). The mutant c.-127C > T was amplified using the following primers: 5'- TGGAGCAGGGATGCCGTCGCT -3' (Forward) and 5'-AGCGACGGCATCCCTGCTCCA -3' (Reverse). The mutant c.-205A > C was amplified using the following primers: 5'- TTCGGACAGCCACTCCAGCCC - 3' (Forward) and 5'- GGGCTGGAGTGGCTGTCCGAA - 3' (Reverse). Then the single endoglin mutant c.-9G > A was used as a template to generate the double mutant c.-9G > A and c.1A > G in the presence of following primers: 5'- ATGGACAGCGTGGACCGCGGC -3' (Forward) and 5'-GCCGCGGTCCACGCTGTCCAT -3' (Reverse). The resulting pUC13 plasmids containing wild type and mutant sequences were digested with EcoRI and the 3-kb endoglin fragments were inserted into the pCEXV expression vector . The expression vector 437/586-Endo encoding a hemagglutinin (HA)-tagged truncated version of human endoglin in pDisplay vector (Invitrogen) has been reported . The monkey kidney COS-7 cell line was cultured in DMEM supplemented with 10% heat inactivated fetal calf serum, 2 mM L-glutamine, penicillin (100 U/ml), and gentamycin (25 mg/ml). For functional studies, cell transfections were carried out using SuperFect Reagent (Qiagen, Hilden, Germany) as vehicle for plasmids, according to the manufacturer's instructions. Cells were cotransfected with endoglin constructs in pCEXV and HA-437/586-Endo in pDisplay to correct for transfection efficiency. Twenty four hours after transfection, cells were lysed in lysis buffer and subjected to immunoblotting with anti-endoglin (clone P4A4; DSHB, University of Iowa), anti-HA (clone 12CA5; Boehringer Mannheim) or anti-actin (clone AC-15; Sigma) mouse monoclonal antibodies . The presence of the specific proteins was revealed with horseradish peroxidase conjugated anti-mouse IgG (Dako, Barcelona, Spain) and the reaction was developed by addition of supersignal chemiluminescent substrate (Pierce, Thermo Scientific, Spain). Protein bands were visualized with a ChemiDoc™ XRS+ equipment (Bio-Rad, Madrid, Spain) and their intensity was quantified using Image Lab™ software. To understand the role of 5'UTR of ENG we sequenced the noncoding region of exon 1 of ENG for 154 unrelated patients/probands with 2 or more clinical diagnostic criteria. These results revealed three sequence changes; c.-127C > T, c.-205A > C, and c.-9G > A. Out of 154, three had c.-127C > T, one had c.-205A > C, and three had c.-9G > A mutation. When available, probands' family members were studied to see if the mutation tracked with the disease. For the c.-127C > T mutation, we included a family from Northern Spain to provide additional information about this mutation. Clinical manifestations of the probands and their evaluated family members are summarized in Table 1. Cases listed as having no solid organ involvement had screening for pulmonary AVMs (PAVMs) by contrast echocardiogram and/or chest computed tomography (CT) and for brain AVMs by a contrasted magnetic resonance imaging (MRI), and physical examination and medical history that did not suggest other AVMs. Sequencing results of 134 healthy control samples did not reveal any sequence change in the 5'UTR of ENG. *NI: Not informative. Based on family history it is possible that this mutation segregates in the family. However, a de novo event cannot be excluded. The c.-127C > T heterozygous change was found in three out of the 154 clincal HHT cases and in one case from Northern Spain (family 4). For one of these cases (family 1), an affected sibling was also available and was found to be positive for the mutation. Two of the siblings met clinical diagnostic criteria with frequent epistaxis, typical telagiectasia, PAVMs, and gastrointestinal (GI) telangiectasia. The second patient (proband 2) was a member of a family (family 2) linked to the ENG by locus specific short tandem repeat (STR) markers. The ACVRL1 region was excluded in this family (data not shown). There were 5 clinically affected family members available for the family segregation study (Figure 1a). The mutation is carried by all studied family members affected with HHT. Although our 67 year old proband did not have any solid organ involvement, an 18 year old grandniece had a spinal AVM, an 8 year old grandnephew had cerebral AVMs (CAVMs), and three other affected family members had pulmonary AVMs (PAVMs). Family members of the third patient (proband 3) were not available for family segregation study. Proband 3 had PAVMs, telangiectases on the face and 2-6 episodes/week of epistaxis. The c.-127C > T mutation was also found in one family proband from Northern Spain (family 4). No other affected family member, including his deceased mother, was available for a segregation study. But the mutation was not seen in his unaffected father or brother (Figure 1b). A. Family segregation study for family 2. The pedigree for family 2 is shown. The c.-127C > T mutation was shown to segregate among affected individuals in this family, where 5 clinically affected family members were available for the family segregation study. 1B. Family segregation study for family 4. The pedigree for family 4 is shown. Three family members were sequenced. Two unaffected family members were shown to be negative for the mutation. 1C. Family segregation study for family 6. The pedigree for family 6 is shown. 3 family members were available from family 6. All 3 carried the -127C > T mutation. The sequence ideogram and neighboring sequences of the c.-127C > T mutation are shown in Figure 2a. This sequence alteration creates a potential AUG initiation codon at base -127 from translation initiation of the ENG gene. The c.-127C > T change is not reported in the NCBI dbSNP database. NetStart 1.0 Prediction Program  predicts that this mutation creates a new translation start site (TIS) with an altered reading frame (Figures 2c and 3). Interestingly, the sequence surrounding the new TIS fits well with the Kozak consensus and other motifs that play a major role in the initiation of the translation process [26, 27], suggesting that this new TIS may be functionally active. Because translation usually initiates solely at the first ATG codon in an adequate context, it is likely that the new TIS at -126/-128 is competing advantageously with the constitutive TIS at +1. To test this hypothesis, we generated a mutant construct in a full length endoglin cDNA, that contains the 5'UTR , where the c.-127C > T change was introduced (Figure 3). The wild type and mutant constructs were cloned into an expression vector and the levels of endoglin protein expression were assessed by transient transfection in the monkey cell line COS-7. 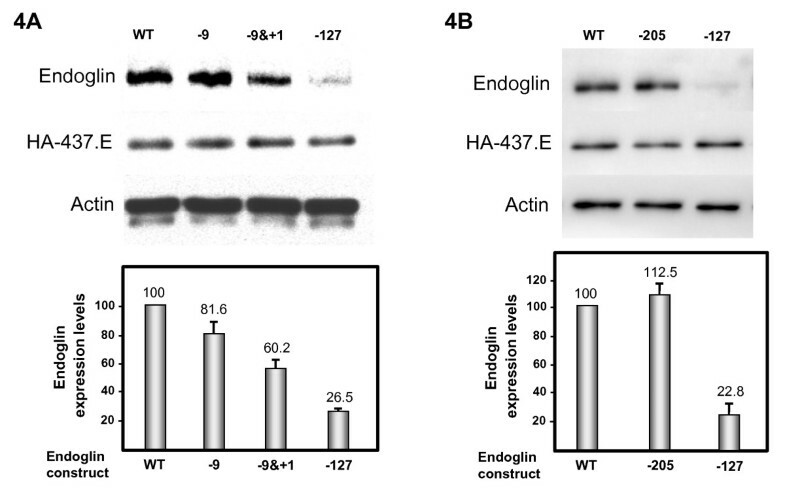 As shown in Figure 4, we found that protein expression levels of the mutant endoglin construct c.-127C > T were markedly reduced (74%) with respect to the wild type construct. This result suggests that the c.-127C > T mutation generates a functional TIS out of frame that interferes with translation initiation of the constitutive ATG at +1, leading to endoglin haploinsufficiency. A. Sequencing results from one individual with the c.-127C > T heterozygous mutation. The forward sequence is shown. The arrow indicates the position of the mutation. 2B. Sequencing results from two individuals (one homozygous and one heterozygous) for the -9G > A mutation. The arrow indicates the position of the mutation. 2C. Schematic representation of endoglin mRNA. The 5'UTR, the 3'UTR and the open reading frame (ORF) are indicated. Endoglin cDNA accession number (X72012) corresponding to the 3073-bp mRNA of endoglin  and the gene ID (GI, 402206) are also included. The sequence of the 5'UTR and part of the signal peptide (-282/+15) is shown. Asterisks indicate the positions mutated in panels 2a and 2b. Schematic representation of wild type and mutant versions of endoglin. The 5'UTR, the 3'UTR and the region corresponding to the ORF are indicated (top). The sequence of wild type (WT) and mutants (c.-127C > T; c.-9G > A; c.-9G > A and +1A > G) corresponding only to the -162/+15 region is shown. Asterisks indicate the positions of the HHT mutations of Figs. 2a and 2b. The constitutive translation initiation (+1), the predicted translated amino acids (three letters code in green) as well as the putative translation initiation sites (brown broken arrow) are also indicated. Functional analysis of ATG endoglin mutants. COS-7 cells were transfected with wild type (WT) or endoglin mutants 4A: c.-9G > A (-9), c.-9G > A & c.+1A > G (-9&+1) or c.-127C > T (-127), and 4B: c.-205A > C (-205) in the presence of HA-437/586-Endo in pDisplay (HA-437.E) to correct for transfection efficiency. After 24 h, cells were lysed and total cell lysates were subjected to western blot analysis using anti-endoglin, anti-HA or anti-actin antibodies. As a loading control, the presence of actin is included. Normalized endoglin levels relative to cotransfected HA-437/586-Endo and total actin proteins are shown in the histogram. An arbitrary value of 100 was assigned to WT endoglin. The average of six different experiments is shown in each panel. The c.-9G > A mutation (Figure 2b) was found in three HHT families. Three family members were available from family 6 (Figure 1c). All carried the mutation and had infrequent epistaxis and telangiectases with no solid organ involvement. Proband 7 was 27 years old when she was examined. She had a few telangiectases on her face and infrequent epistaxis only during her childhood. She did not have any solid organ involvement. There were no other family members available for this study. All of these patient's clinical findings were relatively mild, none of them had solid organ involvement or severe/frequent epistaxis causing anemia or blood transfusion. Proband 8 was found to be homozygous for c.-9G > A mutation (Figure 2b). In order to confirm this result and to rule out primer binding site polymorphisms, this region was sequenced with three different primer sets. Multiplex ligation dependent probe amplification (MLPA) method was used to test for a large deletion of the region. MLPA results and sequencing with different primer sets confirmed that proband 8 carries two copies of the mutant allele for this region (data not shown). Proband 8 had daily epistaxis and telangiectases on his lips, tongue, ear, hands, face and pharynx. His son's clinical findings were not as profound as his father. He had a few telangiectases on his lips and face, and epistaxis. Neither of them had solid organ involvement. His son was not available for molecular testing; however, he is an obligate carrier for the mutation as his father is homozygous. The parents of the proband were deceased, thus not available for examination or testing. Neither was known by the proband to have nosebleeds or telangiectasia. The mother reportedly died at age 42 of tuberculosis and father of a myocardial infarct in the decade of his 60s. The c.-9G > A mutation is not reported in NCBI dbSNP database, nor it was seen in our control group. This mutation is predicted to create a new TIS with the same reading frame as endoglin and a resulting protein which contains three additional amino acids in the leader sequence (Figure 3). Of note, the length of the resulting leader sequence (28 amino acids) is within the normal size range of cleavable amino terminal signal peptides in precursor proteins . To assess whether the new TIS at -9 was affecting the expression of the endoglin protein, we generated two different mutant constructs in a full length endoglin cDNA that contains the 5'UTR. A single mutant contained the c.-9G > A change of the HHT patients, while a double mutant contained both the c.-9G > A mutation plus the c.1A > G mutation. Functional studies of the c.-9G > A mutation showed that expression of the mutant protein was reduced approximately 20% compared to the wild type protein (Figure 4A). To prove that the ATG at -9 was functioning as a real TIS, the constitutive initiation site at position 1 was abolished in the double mutant (c.-9G > A and c.1A > G). Thus, transfection studies with this double mutant demonstrated that the corresponding endoglin protein was expressed, although at a much lower level (60%), as compared to 81% with the c.-9G > A construct. While the predicted mature endoglin protein driven by the TIS at -9 is identical to the one driven by the constitutive TIS at +1, the decreased expression levels of endoglin with the c.-9G > A mutation are likely due to a lower translation efficiency and/or a less efficient processing of the endoglin precursor protein through the secretory pathway. Taken together, these results suggest that the mutation c.-9G > A confers slightly reduced expression of the mutant protein that is compatible with the mild effect in heterozygosis and a more severe, but still classical, HHT phenotype in homozygosis. The c.-205A > C heterozygous variant was found in one patient (Proband 5). Three family members were available for study. It was not found in a brother and father with infrequent, recurring nosebleeds and telangiectases in characteristic locations, but was identified in an asymptomatic mother. This variant was not found in dbSNP database, nor was it found in healthy controls. However, based on in silico analyses this variant is not predicted to have a significant effect on the regulation of the translation or transcription. In the family segregation study this mutation does not track with symptoms of HHT, and in silico analysis does not support pathogenicity. Expression analysis of the mutant construct (c.-205A > C) showed similar protein levels as the wild type construct (Figure 4B) confirming that it is a benign sequence change. HHT is a genetically heterogeneous disease with at least three causative genes [9–15]. 15% of clinically diagnosed HHT cases cannot be explained by mutations in the coding regions or exon/intron junctions of ACVRL1, ENG, or SMAD4[19, 20]). Yet in some families, linkage data suggests ACVRL1 or ENG to be the causative gene. Therefore, non-coding regions may play a role in the disease. However, previously described mutations in ENG were located only on the coding regions and exon-intron junctions of the gene [29, 30]. So far, no 5'UTR mutations or deep intronic mutations have been described. ENG promoter activity was found to be within the upstream 400 bp region from the TIS, and an area near the transcription initiation site of ENG was determined to be essential for promoter function [21, 31]. We therefore chose this critical region to analyze in our unexplained HHT cases. We have identified a 5'UTR mutation (c.-127C > T) in 3 unrelated probands, 2 of which had family members evaluated for co-segregation studies. One family with the same mutation from Northern Spain is also included in this study for additional clinical description of the mutation. All affected individuals had classical clinical findings of HHT disease, including many with solid organ involvement. The clinical findings and medical histories in these four families are typical of HHT1 families previously reported . 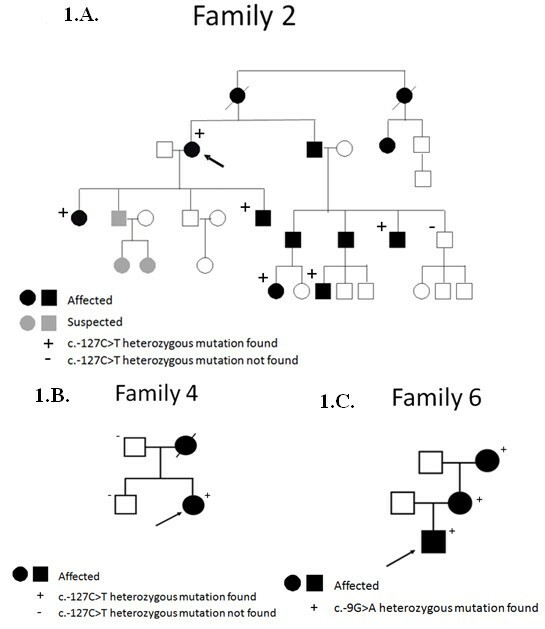 The number of PAVMs observed in these families with c.-127C > T mutation seems possibly greater than typical for HHT1 disease, this may represent ascertainment bias since the majority of these patients were seen in an HHT specialty clinic that tend to attract patients with pulmonary AVMs for treatment and expected variation of HHT. During the revision of this manuscript, Kim et al reported a Korean family with the c.-127C > T mutation, in which the proband of the family has epistaxis and PAVM . Current data suggest that most disease-causing mutations in ENG result in haploinsufficiency [8, 32, 34–36]. Thus, HHT is assumed to result from lack of sufficient protein for normal function . Mutations resulting in structural alterations by misfolding and intracellular degradation of these proteins lead to lack of surface expression of the mutant proteins. The c.-127C > T mutation in the 5'UTR creates a new TIS resulting in an out-of-frame product. Translation initiation from this novel start site predicts prematurely truncated protein with no homology to wild type protein. This mutation effect would be similar to any frameshift mutations seen in the ENG, which is lack of the protein expression on the cell surface. Expression studies confirmed that endoglin protein level is decreased to 26% of the wild-type construct, a figure compatible with quantitative measurements of endoglin levels in endothelial cells derived from HHT1 patients . Kozak sequences are conserved sequences that ribosomes recognize as the start of translation of the protein [26, 27]. The original TIS of the ENG gene does not have a strong Kozak consensus sequence. This and the fact that translation preferentially initiates at the first ATG codon suggest that the new TIS is competing advantageously with the constitutive TIS at +1. 5' UTR mutations that change the initiation codon have been reported as disease causing mutations for other disorders [38, 39]. However, our study provides the first functional evidence that 5'UTR of the ENG cause HHT. The second sequence change found in this study is c.-205A > C. This variant does not affect the ATG translation initiation. There is no specific sequence in the endoglin promoter affected by this mutation based on in silico studies. Family segregation study also suggests that c.-205A > C is a benign sequence change (Table 1). Moreover, studies with the -205A > C mutant construct confirmed that this variant does not affect the expression level of ENG protein. The c.-9G > A mutation has been found in three probands, one of whom is homozygous for the mutation. Proband 6, her mother and proband 7 were heterozygous for this mutation with mild clinical findings and no organ involvement. Proband 8 with a homozygous mutation had symptoms of HHT typical for a 78 year old heterozygous mutation carrier. It might be speculated that heterozygotes with this mutation might be more mildly affected than typical HHT patients. Although none of the heterozygous probands or affected family members was found to have solid organ involvement, no conclusion can be made from this small number of cases as to whether the epistaxis or oral/dermal telangiectases resulting from this mutation are more mild than typical. The c.-9G > A mutation also creates a new TIS, yet does not alter the reading frame. Based on viability in the homozygous state, we suggest that the c.-9G > A mutation results in reduced, but not absent, protein production or function. The double construct study supports that the c.-9G > A mutation does not create a strong TIS and the existing TIS is also being used for translation. This confirms the leakiness of the initiation of the translation. Given the possibly milder phenotype in heterozygous patients, and viability in a homozygote patient, we conclude that the c.-9G > A mutation may represent a milder HHT mutation, which has never been reported before. In addition to the consequences in translation, the pathogenic mutations at c.-9 and c.-127 may also have effects in the transcriptional regulation of Endoglin. In this sense, an in silico analysis using the MatInspector program revealed that several putative consensus motifs for transcription factors were either destroyed or generated (see Additional File 1). More specifically, the mutation c.-127C > T generates the disappearance of consensus motifs for WHNF and EGRF family members, while raises a new motif for the general transcription factor IID. Moreover, the mutation c.-9G > A generates the disappearance of several binding sites for EGRF, HESF, EBOX, HIF or p53 family members, while raises several motifs for p53, GCMF or SRFF transcription factors. Finally, it is worth mentioning that many mutations leading to frameshift and truncation may result in nonsense mediated decay and therefore reduced mRNA levels . In addition to the effects on protein translation/processing analyzed here, we cannot rule out the possibility that these ATG mutations may also decrease mRNA stability, as previously described in HHT1 for several truncation mutations of ENG. 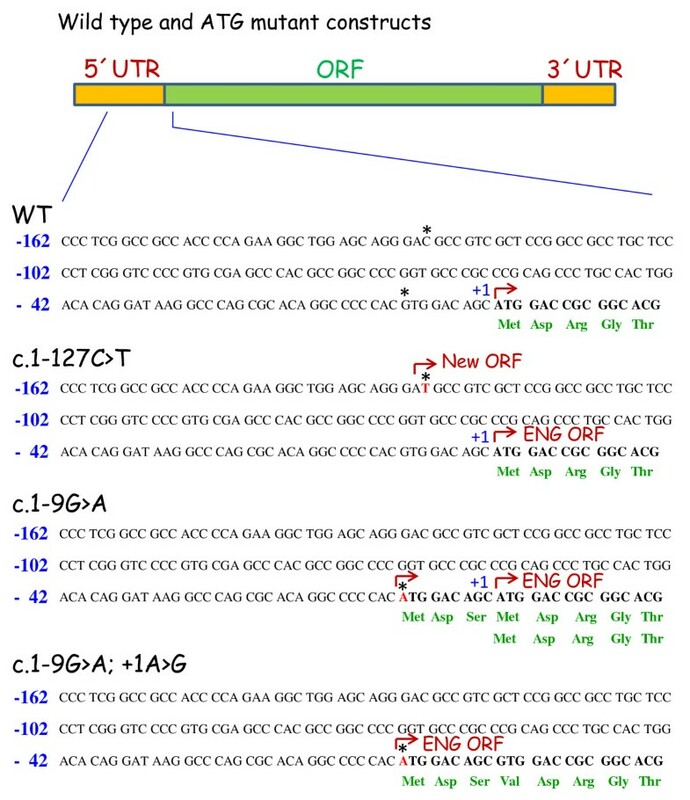 This study highlights two novel mutations in the 5'UTR region of the ENG gene, c.-9G > A and c.-127C > T. In vitro expression studies predict that these mutations would result in reduced expression of the endoglin protein. Taken together, the clinical, co-segregation and functional data suggest these mutations cause HHT in the families studied. A 78 year old with HHT who is shown to be homozygous for c.-9G > A suggests that this mutations causes a leakiness of transcription initiation and possibly a milder clinical phenotype. This is the first report of an apparently pathogenic mutation found in the homozygous state in a patient with HHT. In summary, we detected mutations in the 5'UTR region of the ENG gene in 8 of 154 unrelated patients with known or suspected HHT in whom sequencing of the coding region and intron/exon border region of ENG and ACVRL1 had failed to identify a mutation. Analysis of the two mutations at the protein level found in seven probands suggests the involvement of the mutations in the pathogenesis of HHT. The 5'UTR of the ENG gene should be included in genetic testing for HHT to increase clinical sensitivity. This work was supported by grants from Ministerio de Ciencia e Innovación of Spain (SAF2007-61827 to CB; SAF08-01218 to LMB), and Centro de Investigación Biomédica en Red de Enfermedades Raras (CIBERER). The CIBER de Enfermedades Raras is an initiative of the Instituto de Salud Carlos III (ISCIII) of Spain. This work was also supported by a grant from the International HHT Foundation. KD and LMB carried out the molecular genetic studies. CL and FB carried out the functional studies. WWD performed the linkage analysis studies. DS and JM provided clinical evaluation/information. KD, PBT, CB, and JM wrote the manuscript. All authors read and approved the final manuscript.